Walmart has released a new commercial, urging you to send your kids back to school with the confidence of a hero and get all the gear you need at Walmart. 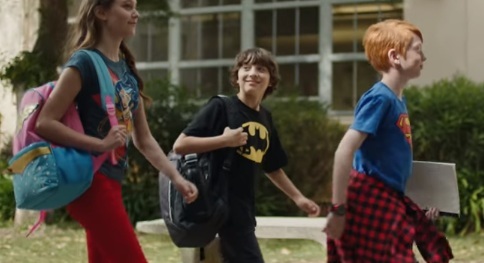 The 30-second spot, dubbed “Own the School Year Like a Hero”, features a bunch of superheroes, including Spider-Man, Wonder Woman, and Batman, taking their stuff and going to school, where they walk among students. As the ad comes to an end, we get to see the heroes turning into kids that wear T-shirts with the logo representing the respective heroes and strutting down the street with the confidence of a hero. The song playing in the background is Whitesnake’s hit single “Here I Go Again”, originally released on their 1982 album, “Saints & Sinners”. Besides Short Sleeve T-Shirt with superheroes’ logo, there are also pencils, backpacks and action figures. Moreover, there are many school supplies with discounted prices.